This 150w electric towel rail by Kudox has a compact design so that it can fit into bathrooms with restricted space. Its 1.5m² heated area provides effective towel warming, as well as additional supplementary heat. View Kudox 150w White Towel Rail datasheet here. Kudox towel rails and accessories come with a 1 Year Manufacturer’s Warranty (subject to manufacturer's terms and conditions). The White 150w Kudox Electric Towel Rail is an essential budget towel rail, perfect for towel warming in smaller bathrooms. This model of the Kudox 150w comes with a white enamel finish and a simple, straight-bar design that will complement any bathroom interior. 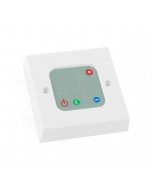 For extra safety, this product comes with a high IP55 ingress protection rating and is suitable for installation in zones 1 and 2 of your bathroom. Once attached to the wall-brackets, the fitted depth of this rail comes to 79mm. The Kudox 150w comes with a 1 Year Manufacturer’s Guarantee. A built-in thermo-fuse inside the heating element safeguards the towel rail against overheating. Electric towel rails for bathroom installation must be installed by a qualified electrician. Installing electric heating is a quick and easy process with none of the mess and expense of installing plumbing. All fixtures and fittings are supplied.